Make crunchy, delicious, healthy taco shells in just 5 minutes. The Quick Taco Rack as seen on TV makes it easy to make crunchy, delicious, healthy taco shells in just 5 minutes and without all the mess or deep fried fat. We all love the irresistible crunch of tacos, but frying them in oil adds unwanted fat, mess and so much time! 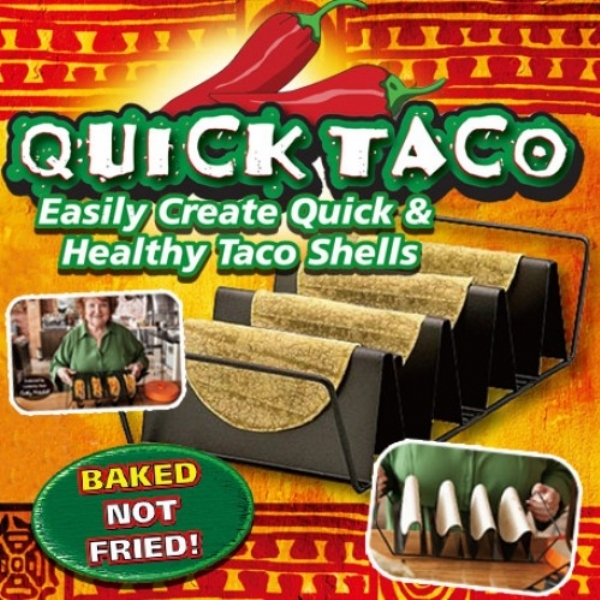 With Quick Taco, you bake your own tortilla shells fresh each time - for the crunchy tacos you crave without the grease! The Quick Taco rack holds up to 4 tortillas into the shape of tacos for easy, fast tacos all at once. No more frying one taco at a time! Just place flour or corn tortillas on the rack, pop in the oven and in minutes you have crisp taco shells ready to stuff with your favorite toppings, and sauces. After baking, simply flip rack over and it holds your shells for easy filling and serving. The incredible Quick Taco is great for so much more than savory tacos. The dessert ideas are endless. Add a little sugar or cinnamon, ice cream, or fruit with whipped cream for the perfect sweet hand-held treat! Saw this product on TV a while back and didn&apos;t get it. Orderd direct and what a surprise. My husband and I love tacos and he is very picky about frying his tacos. After one use, he is now a convert to healthy, semi-cruncy (5 min. in oven)tacos. An absolute MUST in every household that likes tacos. would be awesome product if you could deep-fry shells as well as bake them in the oven. The taco rack I ordered is a great product, however at the same time I ordered an oven cleaner and have heard nothing regarding this shipment. Took my money but have yet to deliever all my merchandise. Not at all happy about this. Don&apos;t know if I will ever order from you again because of this nor would I recomment your products.